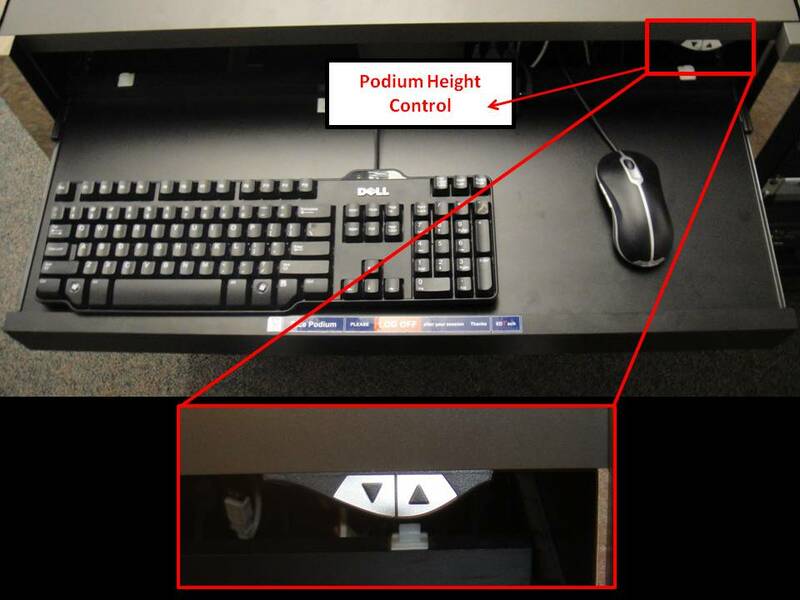 This document provides answers to frequently asked questions about podium computers. The Learning Spaces team puts a lot of effort in designing classrooms to allow users to operate the equipment in an intuitive and homogeneous way. There will be times though, when equipment fails, or things may not be as clear was we intended. If you have problems in the classroom, you can always call the operations desk (x4989) and one of our technicians will be there as soon as possible to assist you. However, some issues can be resolved by the user, using the information below. If you have any suggestions on how to improve the FAQ, please do not hesitate to contact us. Mouse/Keyboard not responding? If the mouse is not responding you can reset it by selecting another computer source (opposite to the source you are using: PC or Mac), move the mouse and then select the source you want to use. This should make the mouse usable for the source that you want. USB slots are conveniently located on both PC's and Macs. 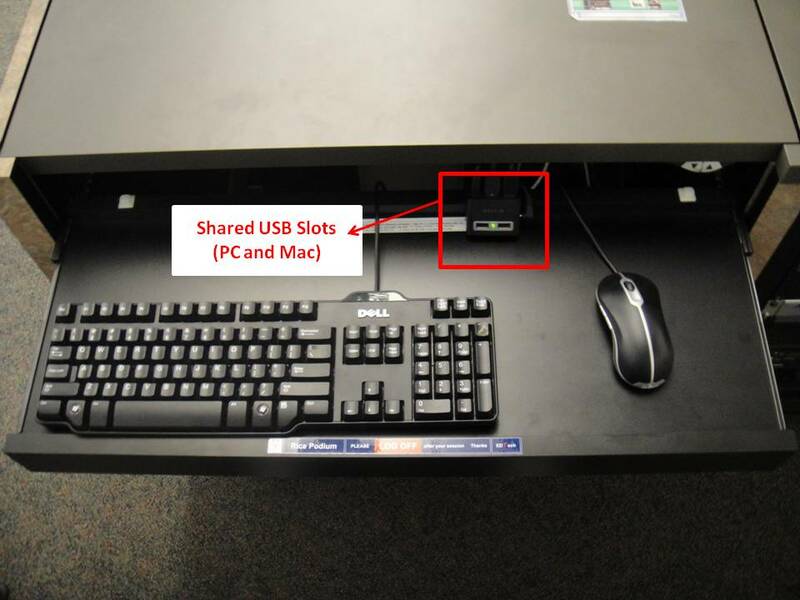 Below are links to show you the locations of the USB slots for your USB devices. Locations may vary. 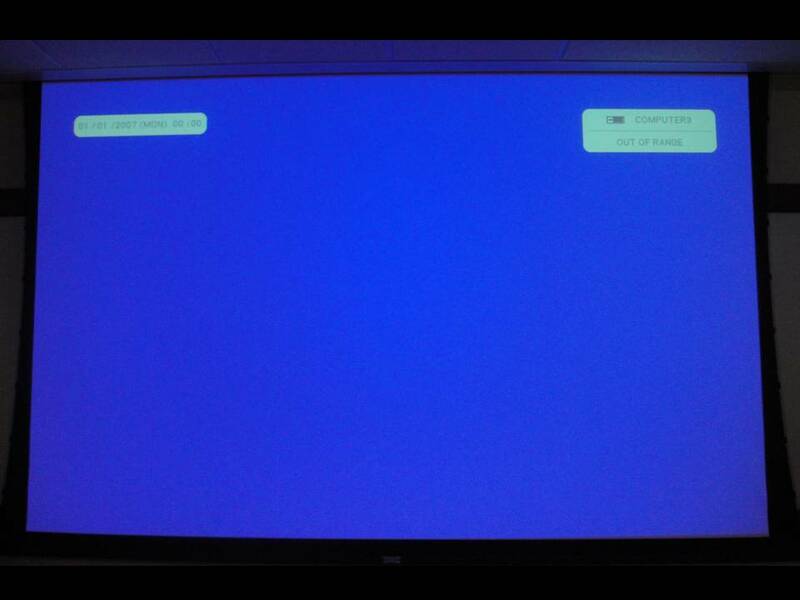 Blue Screen: If the projector is on but all you see projecting is a blue screen, please press the source button again that you want to use (PC, MAC, Laptop). Source should project within a few seconds after the source button has been pressed. If using the Mac or the PC source, you might need to move the mouse or press the spacebar to wake up the computer. Timer: Most of the projectors here on campus have a 90 minute shutoff timer. From the moment the Projector On button has been pressed the 90 minute timer will start. 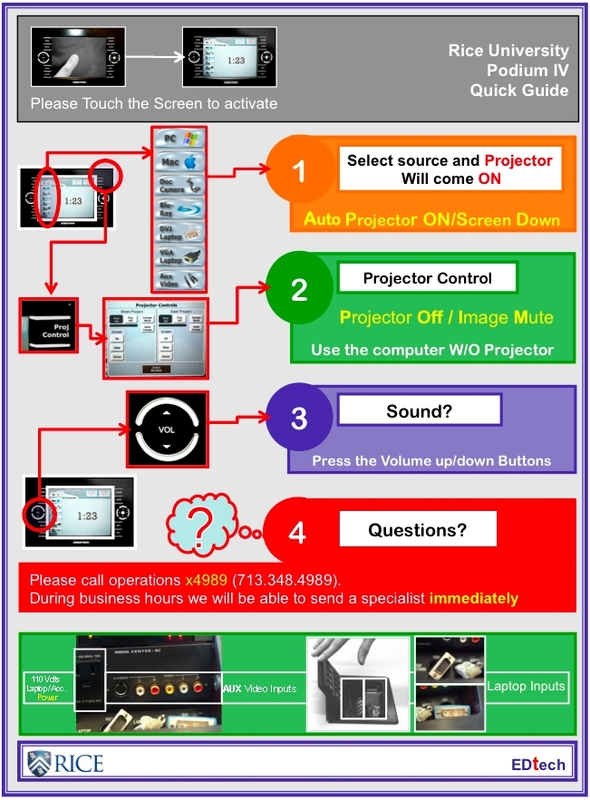 Projectors usually take between 30-45 seconds to warm up and about 45-60 seconds to cool down. After 2-3 minutes, the projector will be ready to function properly. 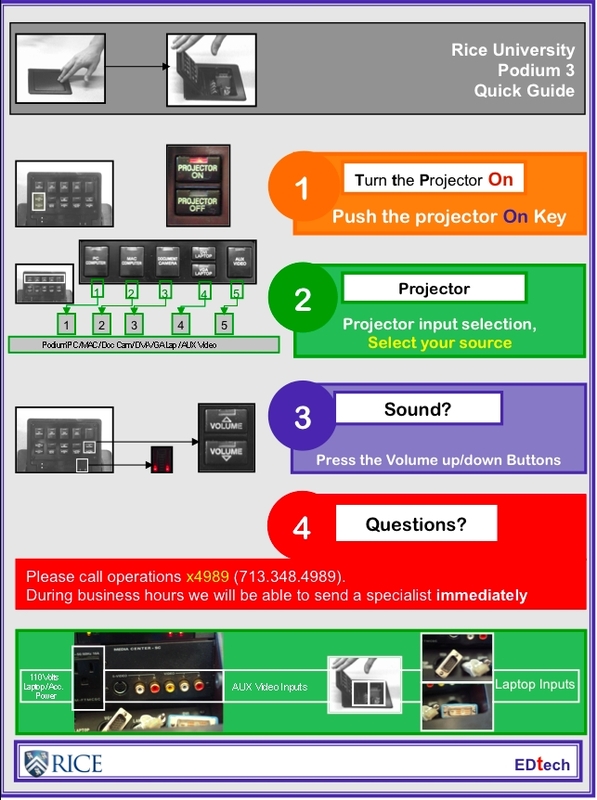 NOTE: If you enter a room and the projector is on, depending on how many minutes it has been on for, it might shut off on you during class UNLESS you press the source button that you want to use while the projector is on. This will refresh the counter and give you a fresh 90 minutes to present. If the monitor isn't working, it could be caused by several different issues. Due to inactivity for a specified time the screen on the feedback monitor might go blank. If this occurs move the mouse or press the any key on the keyboard to wake up the computer. If that doesn't work, make sure the feedback monitor is powered on. The power button location differs depending on what brand/model is in the room. Lastly, depending on how the monitor get manipulated and moved throughout the day, the power cable that powers the monitor may become loose. In order to address this issue, you will have to reset the power cable so that it can be seated tightly and properly in the input. When needing audio for (CD, DVD, YouTube, etc.) please make sure that the volume is not muted. There are three (3) locations that need to be checked and also adjusted to make sure audio is audible in the room. Location 2: The volume control on the PC or Mac. Location 3: The volume control on the Control System. If volume is muted on any one location, you won't be able to hear whatever you are trying to play. If podium is too high or too low you can adjust it by pressing up or down on the podium height control. We have different types of podiums here on campus. 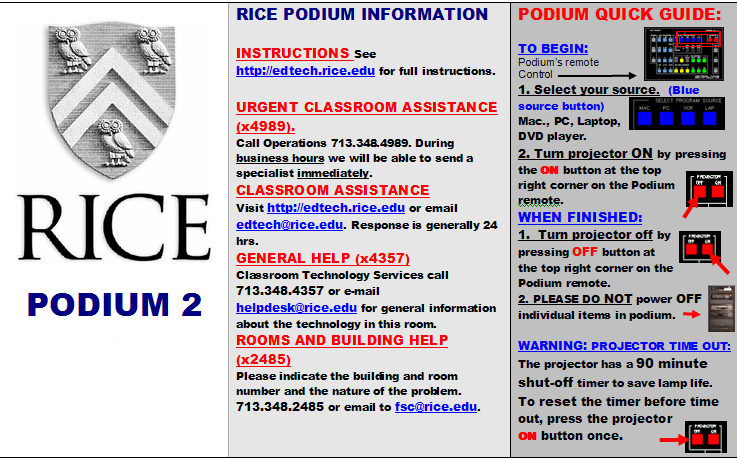 Click on the hyperlinks below to download podium instructions for the podium type that you'll be using to teach. VGA (Video Graphics Array): This computer output is commonly used on PC laptops and some Macs. DVI (Digital Visual Interface): This computer output is commonly used on MAC laptops. The cable tip is wider than the VGA cable mentioned above. *** HDMI output is currently only supported in Rayzor Hall building (except RZR-202, RZR-302 and RZR-310) and the Bioscience Research Collaborative building. Audio: Laptop audio cable is shared and will switch depending on what laptop source you are using. Function Keys: Pressing certain function keys will auto-detect a display once it is connected. Although the function keys may vary from below, these are the most commonly used sequences. Podium account: If the account has been locked by the user Podium you can login (pressing Ctrl+Alt+Delete) using podium as the password. Log-off remotely: If the account has been locked by the previous user please call X-4989 and a tech can remotely log off the PC/Mac within a couple of minutes. It is not necessary for a tech to be present for the log-off process to take effect. Please check the computer within a few minutes. PC/Mac should be ready to be logged on. A generic account is also available for use by using podium as both the user name and password. IT funds software applications that are used campus-wide or by a significant number of students and instructors. Over 150 core software applications are loaded onto each IT-supported computer in classrooms and labs across the campus. Each April, three reminder messages are emailed to all Rice faculty members soliciting their software requirements for the next year. If software requests are submitted late you are not guaranteed the software will be there for your next class. IT will work diligently in getting you the software you need but normally it takes several business days to have software tested, installed, and implemented. Software that is not utilized by a significant portion of the campus is usually purchased by the department requesting the specialized application. Clocks, Chalk, Markers, Chairs, ETC. Unfortunately, IT does not stock or supply chalk or markers. Please ask your department/group coordinator. The Office of the Registrar does not maintain or stock whiteboard markers. Support is limited for Non Registered Conferences or Classes. We will gladly provide contact information of our preferred vendors that have worked on Rice Campus. They will be able to provide you with information and support for your AV needs. More info available here. 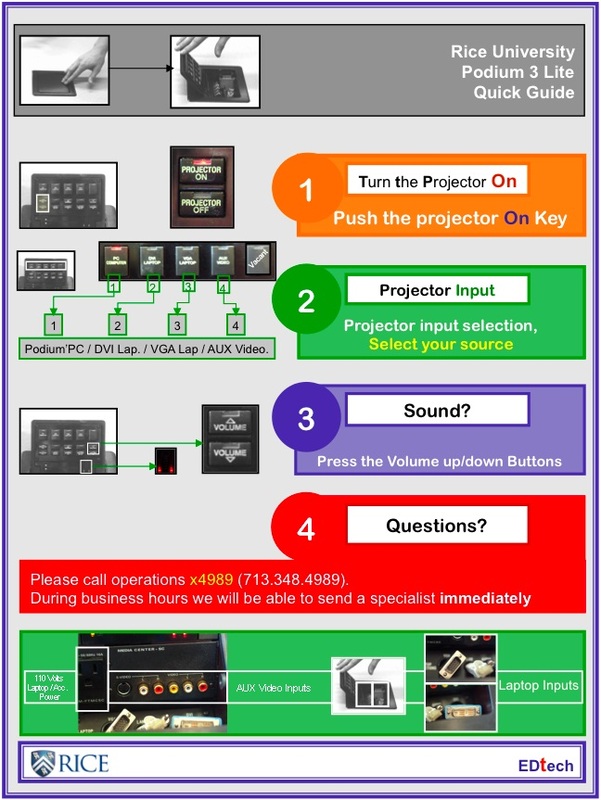 Please visit LearningEnvironment's page on Video Digitization for Canvas and follow the instruction on that page for support. 1) When calling Operations (X-4989) if possible please leave a call back number. 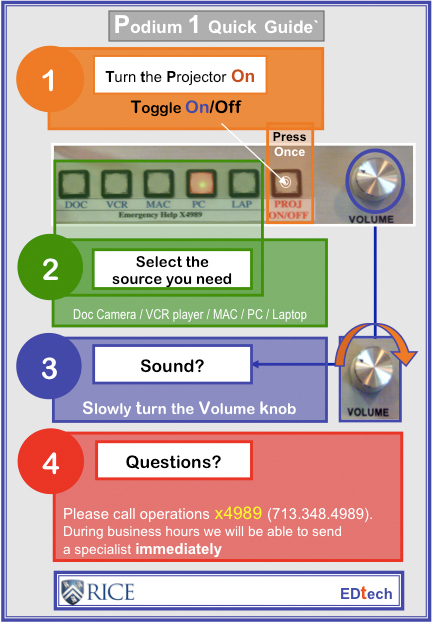 This might help us resolve issues by assisting you over the phone. It will probably take less of your class time to assist you over the phone. 2) Please remember to log off of the Podium computers when class has ended. The classroom computers are in publicly accessible spaces. Forgetting to log off compromises your individual account and can lock the machine for the class that follows you. While this is not as much of a concern for the generic podium account, we still would like to discourage its use. There are important security and performance advantages obtained by using your Net-ID. Anytime you are having a problem in any of our classrooms, you are invited to call Operations at 713-348-4989 and we will come to assist you within minutes (during business hours). Also you can submit a HELP Ticket at: help.rice.edu and keep track of the status of the issue. Podium training sessions are typically offered at the beginning of the fall semester, however, we will try to accommodate training as necessary. If you anticipate the need for assistance with podium usage please contact our Operations Center at (x4989) 713-348-4989.